Favourite American Civil War Regiment? 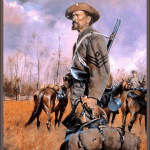 Re: Favourite American Civil War Regiment? 45th Virginia Infantry Regiment, my real life unit... 21st Virginia Ify. Reg. Co. K "Chalk Level Greys" that we portray for their heroic engagement at Culp's Hill on July 2nd, 1863 and at 2nd Kernstown under Gordon... 21st Mississippi, Barksdale's for their heroic efforts from Pitzer's woods & the Trostle Farm, Gettysburg... 1st Tennessee, "Co. Aytch" who took part in engagements in both theatres... most importantly, 57th Virginia Ify. Reg. Armistead's Brigade, "Botetourt Guards" 3pm, July 3rd, 1863 engaged in "Pickett's Charge" with less than 5,000 survivors which my GGGrandad was one of them. I have multiple favorites. To start off, the 49th Indiana Infantry Regiment, the 7th Tennessee Cavalry (CSA), 3rd Tennessee Mounted Infantry (Union), the 1st Tennessee Infantry (CSA) (Archer's Brigade), the 154th Senior Tennessee Infantry, and the 24th Mississippi Infantry. 49th IN- Direct ancestor, James M. Cummins, mortally wounded at Chickasaw Bayou.